Wow, the last 2 months passed in a blink. That can sometimes be good or bad. In this case, it's a little of both. Since my last post, I accepted a new job in St. Louis and have been commuting weekly from our current home in Basehor, Kansas. I've been doing that since April 29 and I'm ready to get my wife and kids moved. I've told many people in the past that Northeast Kansas was the farthest east I was ever going to live, so I guess I'll proceed to shove my foot in my mouth over that comment. With all the new work and all the traveling, I've had very little time with my photography. But, sometimes you have to make sacrifices and there's nothing you can really do about it. Obviously, a primary objective has been finding a house and we succeeded. Now, we are anxiously awaiting our July 8 closing. My second objective was another obvious one - make the most of my weekends spent back with my wife and kids in Kansas and I think I've succeeded on that front, also. But, the weekends have gone much too quick, as well. I mentioned previously about time passing quickly being both good and bad. It's good in the sense that I'm really enjoying my new job and I only have a little more than 2 weeks before my family makes the move to St. Louis and our new adventure will officially begin. If the job was going poorly, then I can't imagine how miserable I'd be having to be away from my family. It's bad in the sense that we'll be moving away from family and an area that has grown on me over the last 11 years. It's never easy to leave family, but at least we're not moving so far away to make frequent visits difficult. As for leaving Kansas, I never imagined I'd ever admit that moving there was probably one of the better decisions of my life. Have I enjoyed Kansas? Yes, at least for the last 9 years. Will I miss Kansas? Absolutely. 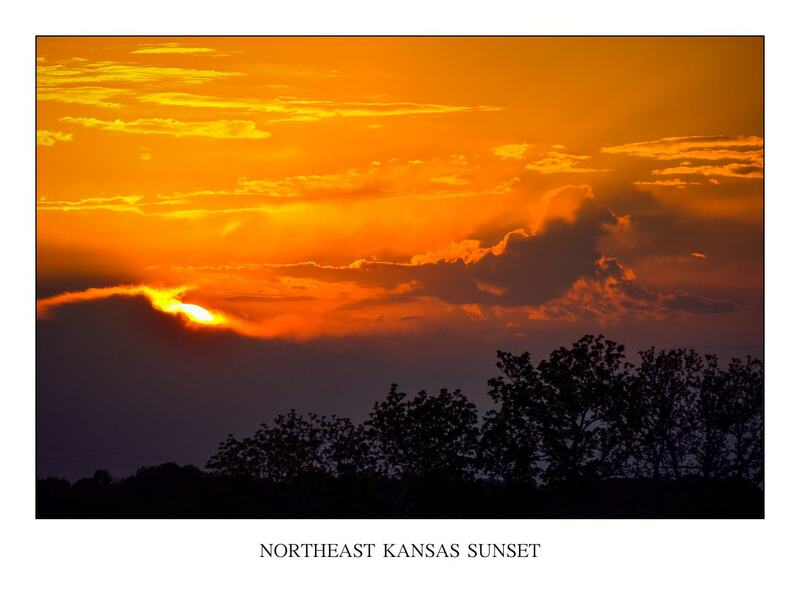 So, to honor the state I've called home since 2002, I give you another magnificent Kansas sunset. I've been awed by many of these over the last 11 years. Seems fitting as the sun goes down on one chapter of our lives and a new chapter begins.